The Siege of Jerusalem in the year 70 AD was the decisive event of the First Jewish-Roman War. The Roman army, led by the future Emperor Titus, with Tiberius Julius Alexander as his second-in-command, besieged and conquered the city of Jerusalem, which had been occupied by its Jewish defenders in 66. Despite early successes in repelling the Roman sieges, the Zealots fought amongst themselves, lacking proper leadership. They lacked discipline, training, and preparation for the battles that were to follow. Titus surrounded the city, with three legions (V Macedonica, XII Fulminata, XV Apollinaris) on the western side and a fourth (X Fretensis) on the Mount of Olives to the east. He put pressure on the food and water supplies of the inhabitants by allowing pilgrims to enter the city to celebrate Passover, and then refusing to allow them to go out. After Jewish sallies killed a number of Roman soldiers, Titus sent Josephus, the Jewish historian, to negotiate with the defenders; this ended with Jews wounding the negotiator with an arrow, and another sally was launched shortly after. Titus was almost captured during this sudden attack, but escaped. In mid-May Titus set to destroying the newly built Third Wall with a ram, breaching it as well as the Second Wall, and turning his attention to the Fortress of Antonia just north of the Temple Mount. The Romans were then drawn into street fighting with the Zealots, who were then ordered to retreat to the temple to avoid heavy losses. Josephus failed in another attempt at negotiations, and Jewish attacks prevented the construction of siege towers at the Fortress of Antonia. Food, water, and other provisions were dwindling inside the city, but small foraging parties managed to sneak supplies into the city, harrying Roman forces in the process. To put an end to the foragers, orders were issued to build a new wall, and siege tower construction was restarted as well. After several failed attempts to breach or scale the walls of the Antonia Fortress, the Romans finally launched a secret attack, overwhelming sleeping Zealot guards and taking the Fortress. Overlooking the Temple compound, the fortress provided a perfect point from which to attack the Temple itself. Battering rams made little progress, but the fighting itself eventually set the walls on fire, when a Roman soldier threw a burning stick onto one of the Temple's walls. Destroying the Temple was not among Titus' goals, possibly due in large part to the massive expansions done by Herod the Great mere decades earlier. Most likely, Titus had wanted to seize it and transform it into a temple, dedicated to the Roman Emperor and to the Roman pantheon. But the fire spread quickly and was soon out of control. The Temple was destroyed on Tisha B'Av, in the beginning of August, and the flames spread into the residential sections of the city. The Roman legions quickly crushed the remaining Jewish resistance. Part of the remaining Jews escaped through hidden underground tunnels, while others made a final stand in the Upper City. This defence halted the Roman advance as they had to construct siege towers to assail the remaining Jews. The city was completely under Roman control by September 7 and the Romans continued to hunt down the Jews that had fled the city. Judean OOB: The Judean Army was composed of Jews of Judea, Jewish Zealots, Jewish Sicarii; in all a force of some 60,000 men, split among three factions. The scenario involving the use of about 10,000 men. Romans OOB: The Roman Army was composed by 4 legions (V Macedonica, XII Fulminata, XV Apollinaris, X Fretensis), in all a force of some 70.000 men. The scenario involving the use of 1 legion, about 10,000 men, engaged in siege. Scale: Each romans unit represent about 480 infantry (1 choort). Each block represent about 120 infantry (1 manipol). Each judean unit represent about 700 infantry. Each block represent about 180 infantry. Take 7 Command Cards . Julian Legions rules is in effect for Romans. 1.1-The Roman player may decide, for each activation of a unit of heavy infantry, medium or auxiliary to adopt the training tortoise, Testudo, or to remove the marker from one unit. The player places a marker on the units tortoise. 1.2-These units can only move 1 hex-activated and only on clear hexagons; special cards can not increase the movement of a unit in tortoise formation. 1.3-These unit if the object of attack "Ranged" can ignore the result and 1 Hit Flag. 1.4-These unit if the object of attack "Ranged" can ignore the result and 1 Hit Flag. 2.1-The player has no Judean Hot Oil 3 counters, placed at the beginning stage with some units. 2.2-They move with the units with which they are placed and removed from the game when used in attack. 2.3-They can be used as a weapon by throwing hexes on the wall adjacent units. They can not be used against units in towers and on adjacent walls. 2.4-The Hot Oil rolls 3 dice and hits hit, due to the retreat with swords and flags. 2.5-The Roman armies with Hit counters Testudo can not ignore. 3.1-Aries and Towers are the Roman siege. Are placed at the beginning of game 1 and 3 Aries Towers soprai blocks, as the backdrop. 3.2-The counters are located above the blocks represent the machines "have gone." Markers are placed under the block machine being activated (the ram trying to create a hole in the wall, try to download the towers on the wall units). 3.3-When pushed, the cars and blocks may move 1 hex for activation. 3.4-The Aries and the Towers, when pushed, create a cover to attack "ranged", Roman armies that drive the machines can ignore 1 flag. 3.5-counter unit with tortoise can not push or activate a siege engine. 3.6-If the marker is placed in Aries or the tower blocks, this means that the drives that are being pushed to activate the machine. See specific rules below. 3.7-If the drive that pushes or activates a siege engine is eliminated, other Roman units can enter the hex of the machine and, at the next turn, push or activate them. 3.8-Judean unit can enter a hex containing the towers and then move clear or hexagons on the wall. 3.9-unit pushing a ram or a tower can not run any attack. If attacked in DC, they can defend themselves and fight back. 4.1-For each activation, if the wall adjacent to the city, the ram can run and pull attack Close Combat 3 dice. For each result "helmet" it causes damage to the wall. 4.2-With 4 damage, a hexagon of wall collapses, using tokens "damage" to save the situation. See specific rules on the wall. 4.3-At the beginning of the scenario and after drawing and seeing his cards, the player can decide where to place the Roman heavy infantry and Aries (red box). 5.1-units located above the Towers, adjacent to the wall if you can attack in melee hexes and move to the wall. 5.2-When placed adjacent to the wall, the towers should be directed to a given side. Attacks are possible only through the DC side. A Roman units attacking tower always use only 1 nut, a Judean units attacking a tower only ever uses 2 dice. 5.3-Roman units that receive a flag, after having moved on hexagonal wall of a tower, the tower must retire. If the tower is occupied by another unit in Rome, they suffer Hit Flag for each receipt. 5.4-units placed on the towers on the wall without pulling against units of the same modifiers (- 1Hit - Flag 1). 5.5-unit placed on the towers can make ranged attacks of Judean units on the wall, without suffering the modifier of the wall. 6.1- A Judean units positioned on the wall is considered a higher proportion of surrounding land. This unit can be attacked only with attack "ranged" and it can ignore a hit and 1 flag. If the unit is attached to the side wall of the Judean, you can also CC. 6.2- If the unit is attacked by units of the towers, which towers above to the rule. 6.3- The hexagonal wall is moving along as basic rules. The movement of the hand map of hexagons to the Roman wall is not possible in practice to use the Roman towers or go through the breach created by the ram. 6.4- A unit adjacent to the Roman Wall, the Roman side of the map, do not attack it may be attacked with CC. It 'can only ranged attack. The Judean units that attack the Roman wall adjacent units (under the wall), they strike with Swords. 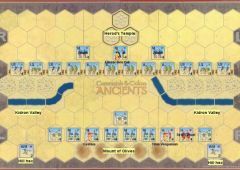 6.5- The wall blocks the LOS between units in hexes clear map from side Judean and Roman side of the map. 6.6- The movement of units from the Judean and Roman Judean hexagons side to the wall map, you can (it simulates the use of stairs), it costs 1 movement point, as in clear ..
6.7- The wall can be struck down by Aries and Rome. You must keep track of the shots with the appropriate markers. Each roll of Red Square and helmet original 1 hit. 6.8- When a hex wall receives 4 damage, the wall collapses in that hex. If there was a hex Judean units, it takes 1 hit and 1 flag. At this point in the hexagon, you can go. It costs a whole to move into the hex activation breach. 6.9- A unit in the breach hex, if attacked in melee, suffer 1 hit for each flag receipt. 6.10-The Roman armies LOS Heavy War have always free to the walls. The LOS is blocked by siege towers. 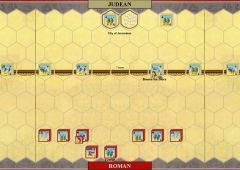 6.11-When a unit enters Rome for the first time in a fortified camp hex (buildings of Jerusalem), it destroys and gains 1 Victory Point. 6.12-hexagons in clear, wall, adjacent, etc.. always apply in any case, the basic rules of Moral Bolster. This scenario has received a few playtest games. The rules are evolving and changing. Hi Giancarlo, in your opinion, is this a balanced scenario?